I remember as if it was yesterday, having just moved back to Seattle I was looking for a new hair stylist. I was sitting in a chair nervously glancing around at the surrounding stylists with brightly colored hair and tattoos, the cape was already snapped around my neck making a run for it difficult. My new stylist, Jennifer Cassady, sensed my unease, placed her hand on my shoulder and said “we do normal too”. A friendship was born and twelve-ish years later I am standing in her kitchen asking her to teach me her favorite recipe. I arrived at Jenn’s house and Parker her five year old opened the door, greeted me and before long was taking me on a full house tour. It was time to get down to the business at hand, dinner. 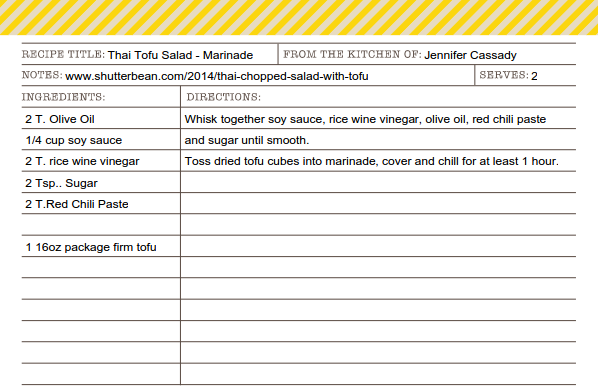 Jenn had already pre-marinated the tofu making this a very easy meal to create. 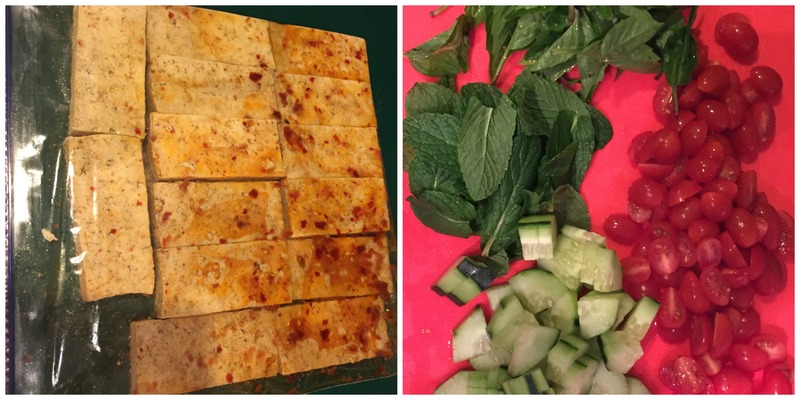 We placed the marinated tofu cubes into the oven to broil for fifteen minutes, taking the time to turn them every five minutes. While the tofu was broiling we prepped the salad ingredients. Easy peasy, clean, chop and toss. 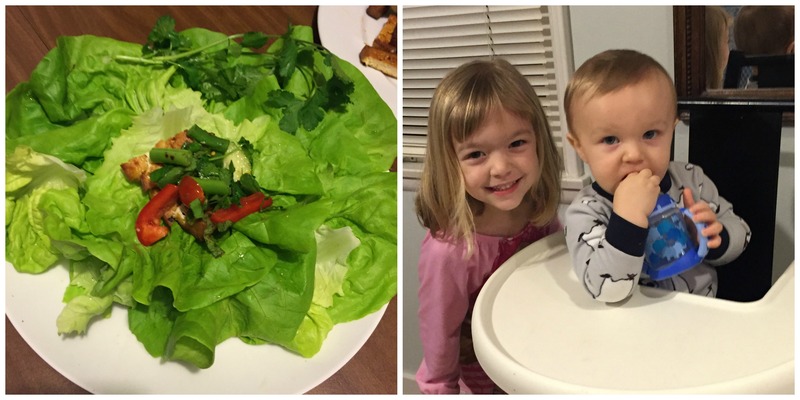 I think the most difficult part of the meal was creating the salad dressing, and by difficult I mean it was more involved than opening a salad dressing bottle and pouring, I actually had to zest! We were able to squeeze in a game of Cat in the Hat before dinner, that had me jumping around a thingamastick with Parker while Miller headed to bed. Dinner, was delicious! It was vegetarian, fresh and filling! 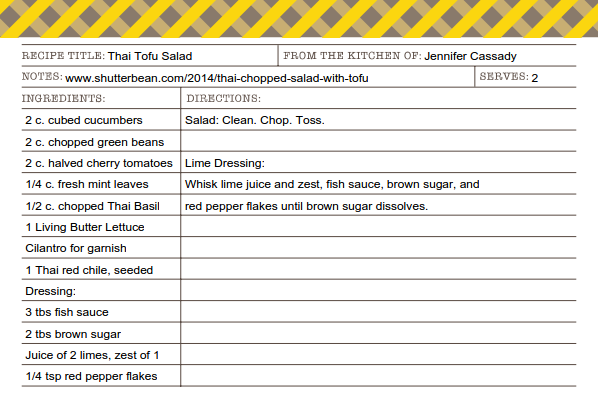 We took individual lettuce leafs and filled them taco style with our salad mix and marinated tofu. Since the end of my road trip I have really been missing these moments, hanging out with friends in their space, playing with their kids, really getting to know them, getting a glance at their home life, Friendly Food is giving me a chance to continue connecting with my friends and for that I am grateful! On another note….if you are looking for a great hair stylist/salon check out Jenn’s new salon Arrow Hair & Beauty located downtown Seattle.